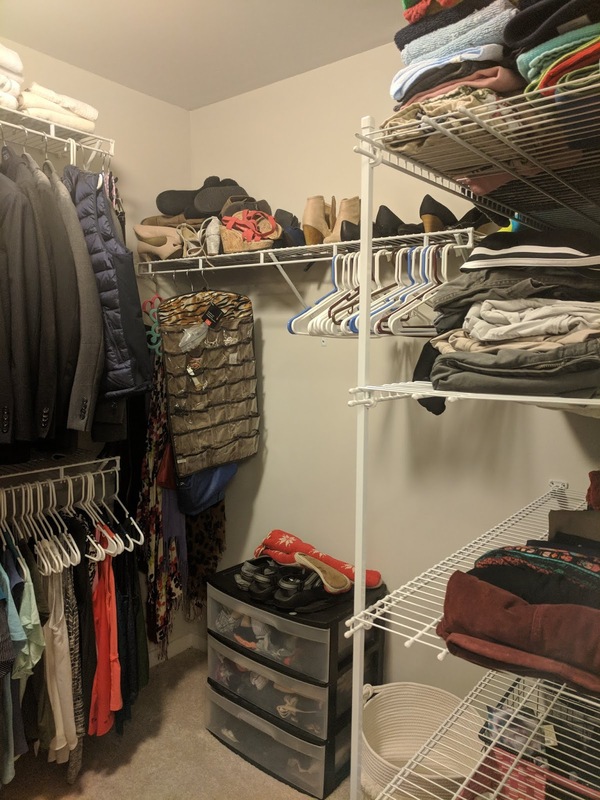 Today I am walking you through how I actually organized my closet once I was done getitng rid of everything. If you missed my first post on how I actually purged all my clothes, catch up here. I organize my closet pretty ridiculously so get ready. In the closet, I have 3 "sections". I keep my out of season clothes in the closet year round - I just reorganize where they are. Since it's insanely hot right now, I've got sweaters and long sleeves pushed to the far left with the tees and tanks easier to reach. Cardigans and dresses stay put. I wear a few cardigans during the summer for cold office days and dresses have a rotation year round. On our shelves, the top two are set aside for towels/Christian's pants. I get the rest :) On my top shelf, I have all my shorts and skirts rolled. The second shelf houses all my jeans and pants, rolled. The KonMarie method advocates rolling clothes for more visibility. I don't love the way it looks, but I will say its been less messy because piles aren't falling over. I'm also able to fit more items on the shelves. I purchased a few boxes from Target for the bottom shelf. I've got one for sports bras, one for leggings and one for tops. I used to keep these in the dresser in our bedroom but it just wasn't effective because I get ready for the gym early in the morning while Christian is still asleep. I like having all my options right there, ready to go, in the closet. Finally, we have a little clear 3 drawer container that Christian has had since college. It's mostly his stuff but I have one drawer for bras/underwear in it. I bought one final rope laundry basket that I have on the floor beside it for all my socks. I have really cold feet and I work out almost daily so needless to say, I have a lot of socks. The final solution I added is a hook on the wall. I had the tendency to hang my robe/bras on the corner of our shelves and it cut visibility to the shelves and looked messy. I've had this habit since we moved in so instead of trying to break a habit, I decided to make it cleaner. I grabbed a hook from Target that will hold those out of the way, but still in a convenient location. To end out the items in our closet: my shoes, jewelry, and scarves. I have two scarf hooks - I separate by thick and light and hang them up on the "empty" side of the closet near my jewelry. I have my winter/formal shoes on the top shelves of the closet now and all the shoes in current rotation on the floor under my shelves. The reason you don't see Christian's shoes is that he keeps all of his in the garage on a shelf. Now that everything has been cleaned out, I have a lot of extra space! I have two and a half empty drawers in the dress and an entire hanging row of the closet that is empty. It's amazing how much I lighter I feel just knowing there are open spaces in our storage solutions! 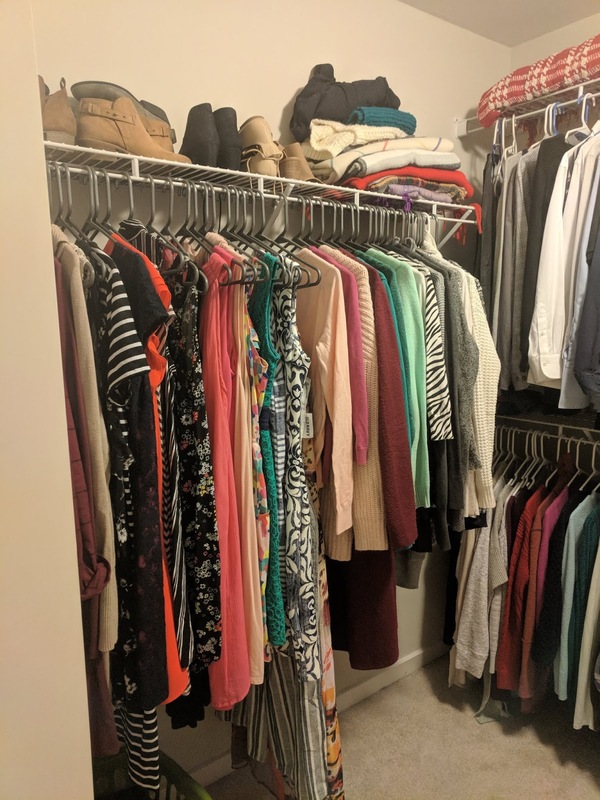 So there you have it: how I mostly KonMarie'd our closet. 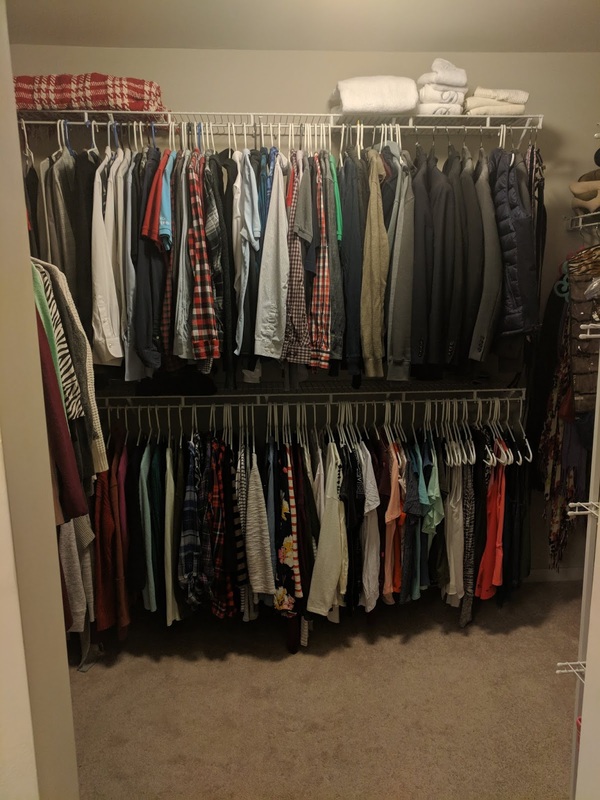 I have purchased some things since my big clean out but I was buying to replace something worn out or filling in a gap I found in my closet during this process.